Austin Shultz presents his proposal and petition for updates to Broadhurst gym. 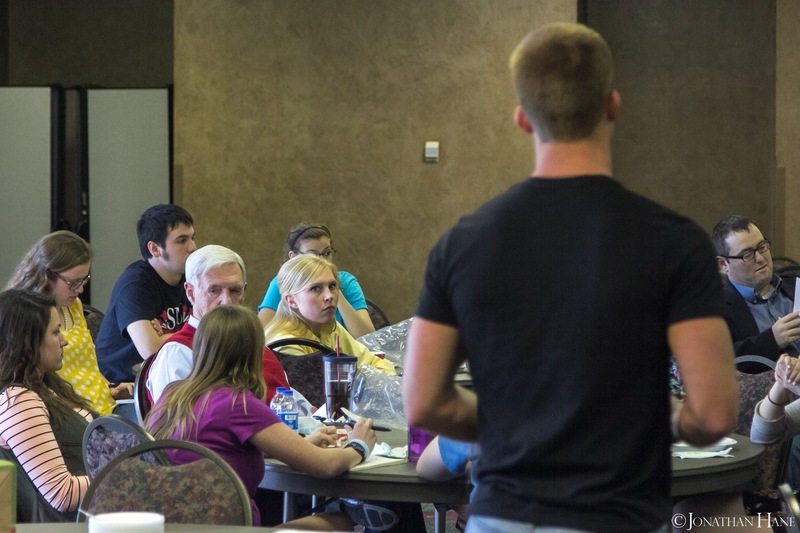 Once a semester, SNU’s administration stays late to meet with the students and hear their complaints, concerns and suggestions. 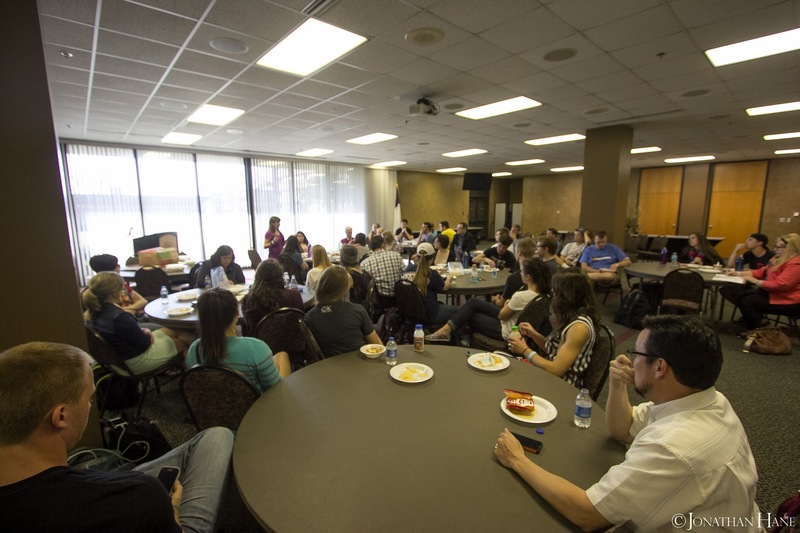 On March 31, this semester’s ‘chat’ transpired in the Heritage room over Chili’s chips and queso. Jordan Leibold, Student Body President, kicked off the meeting with a prayer. Then Byron Crouch thanked the cabinet for installing paper towel dispensers in Snowbarger per their request at the last cabinet chat. Next, Austin Schultz presented a detailed proposal, pictures and petition with 200 signatures to request a Broadhurst building and equipment update. The Echo will report on the full details and optimistic response in the next issue. Students and faculty listen to Grace Williams present information on Pops being open on the weekends. Then, Grace Williams asked the cabinet to support opening Pop’s Lounge on the weekends. This request, along with a petition with 235 signatures, is being worked on by Amber Noyes, Sodexo Manager and Marian Redwine, Director of Community Life. There was also a request for more ethernet ports in dorm rooms. The room had mixed responses to this question. One pointed out that sometimes when there are 10 people hanging out, each with multiple devices, that a good wifi connection would be best. Another student pointed out that it is nice to be able to plug into an ethernet port when taking a test or having a skype interview, so you can be sure the connection is stable. If you have a strong opinion about ethernet ports versus a more reliable wifi, email Scott Strawn. Over spring break, a group of students visited Rice University and saw trampolines on the campus grounds. They asked if SNU could pursue this option. Administration responded that they would be willing to call the insurance company and ask. They cautioned that it could cause a raise in tuition if trampolines were implemented. The last item on the official agenda was to pitch a pipedream for Hatley hall. Students would like to put a rock climbing wall, racquetball courts and, potentially, a coffee shop in the former girl’s dorm. The floor was then opened for student audience members to ask questions. The first question was regarding the clarification that was recently added to the dancing policy. SNU’s definition of what constitutes social dancing was recently updated to be more specific and now more closely resembles that of the Nazarene manual. This clarification will be updated on the website soon. Finally, students wished to discuss the punitive system at SNU. Students said that the punishment system is confusing and seems like it is different for every person. The administration responded that their goal is to create an atmosphere of mercy which requires them to look at each case individually. Decision makers look at whether the incident involved others and what steps can be taken to support the student in making a lifestyle change. Dr. Gresham then asked the room of students if they prefer the time consuming, subjective process that SNU currently has or a zero tolerance policy. The majority of students who chose to participate in the vote said they liked the current policy. He also said that the staff is aware that many students are not caught in wrongdoing but that is because of the code of silence that student keep on campus. This caused one student to reflect on why he does not tell on other students he saw doing wrong. This resulted in an interesting conversation on balancing mercy and justice and what true friendship looks like. Dr. Mike Redwine reminded students that Dr. Gresham receives phone calls often from people saying the punishments are both too lenient and too harsh. Communication between students and administration is important for the health of the institution. Make your voice heard by talking to your SGA representatives, write about your opinions in The Echo, personally meet with or email the cabinet members and/or attend next year’s cabinet chats!